Hundreds of organisations who are, or have been clients, can testify to the effectiveness of our service and have noticed that we have the experience and the passion to respond to their needs. I received a very warm welcome to The Exchange Business Centre. I had a lovely, airy and bright office with Rob and his team creating a professional, friendly and accessible environment. Its great appeal is modern business requirements offered within an historic building. To enable us to hit green targets within the business, it was crucial that our sales team had a base in the East Midlands to save frequent travel north from our Kent headquarters. Once we found The Exchange there was no looking back. The team are now seamlessly hooked up to our cloud based IT systems and are able to access major transport links within minutes. This is also a very cost effective solution for us. We even have our regional conference there now! As a well-established business of 12 years based in Surrey we chose The Exchange to accommodate our processing operation due to good road and rail links. We find it an extremely cost effective solution which provides everything we need to service our customer requirements. The recent improvements Rob and his team have made only serve to reinforce our view. The service we receive from The Exchange is literally second to none. Convenient location, fast broadband, great internal networks, two parking spaces as standard (actually we have three!) Pretty awesome I’d say! Oh yes, and it’s a fun place to work too – everyone seems to have a great sense of humour! We won’t be moving. Our mission is to relieve you of the time consuming stuff associated with having an office which allows you to concentrate on what you do best. BE CONNECTED. Super-fast broadband capable of 150 mbps download speeds. Rail network. Less than a 10 minute walk from two train stations. Newark Northgate is on the East Coast Main Line providing a nonstop service to London of less than 75 minutes. Newark Castle is your access to the recently improved Lincoln-Nottingham-Derby-Birmingham service. Road network. The Exchange is 3 minutes drive from the A1, A46 and A17. In fact at one stage all three used to pass through the town itself! Market town feel. 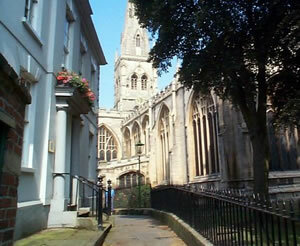 A 5 minute walk takes you to the famous Newark Royal Market ringed by town centre shops. Supermarkets are literally on our doorstep. Lunchtime! We have a riverside location for those all too precious moments of workday downtime. Our ducks & swans can be very stress relieving!